5.0 Earthquake hits the Galapagos Islands. Italy – More than 15,000 people are being housed in temporary shelters after the powerful earthquake on Sunday jolted central Italy, a region battered by relentless tremors since August. Dramatic images from the disaster zone show villages that appear entirely flattened, with historical buildings, including churches, crumbling when the quake struck 10 kilometres below the earth’s surface. The basilica of San Benedetto had withstood the tests of time since the end of the 14th century. But on Sunday, the church that paid homage to the patron saint of Europe, Saint Benedict, was reduced to a heap of rubble. With the announcement of two additional autochthonous, or locally acquired Zika virus cases Friday in the Philippines, the Department of Health now puts the case tally at 19 this year. Gauteng health MEC Qedani Mahlangu revealed this in a statement on information based on the annual reported presented to the portfolio committee for the 2015/16 financial year on Friday. “For the period under review‚ about 3040 new cases of severe acute malnutrition were identified‚ and out of those about 1512 children were admitted at different facilities and‚ unfortunately about 113 deaths were experienced as a result of severe acute malnutrition‚” Mahlangu said. Gauteng is Africa’s wealthiest economic and industrial area. A large space rock is going to come fairly close to Earth later tonight. Fortunately, it’s not going to hit Earth, something astronomers are sure of thanks in part to a new tool NASA is developing for detecting potentially dangerous asteroids. The tool is a computer program called Scout, and it’s being tested at NASA Jet Propulsion Laboratory in Pasadena, Calif. Think of Scout as a celestial intruder alert system. It’s constantly scanning data from telescopes to see if there are any reports of so-called Near Earth Objects. If it finds one, it makes a quick calculation of whether Earth is at risk, and instructs other telescopes to make follow-up observations to see if any risk is real. Thailand – Several districts of this southern province have been hit by flash floods following heavy rain, provincial disaster prevention and mitigation chief Chamnong Sawatwong said on Monday. Numerous roads have been washout out and the ferry service between Don Sak and Koh Phangan have been suspended. 6.5 Earthquake hits central Italy. 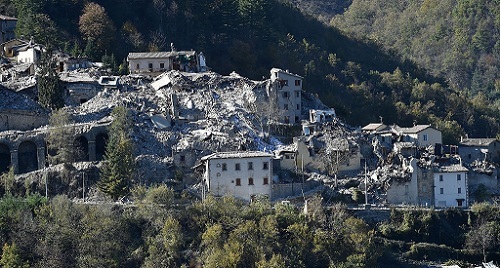 A strong earthquake measuring 6.6 magnitude struck central Italy on Sunday, causing the collapse of more buildings in small cities and towns already shaken by tremors in the past two months, although there no immediate reports of casualties. Italy’s emergency services said there was serious damage in multiple locations in the central regions of Marche and Umbria on Sunday. State broadcaster RAI said three people were rescued from rubble in the town of Ussita, but there were no reports of deaths. The ancient Basilica of St. Benedict in the walled town of Norcia, almost 100 kilometres from Perugia, was devastated by the quake, the monks said. Images on television showed one side of the church reduced to rubble, and another church in the town centre also collapsed. Local authorities said many towns and villages already battered by the 6.2 quake in August had seen further significant damage. 5.1 Earthquake hits offshore O’Higgins, Chile. Egypt – Update – Torrential rainfall and flooding in Egypt have claimed the lives of at least 30 people. Nine people died in South Sinai, eight in Sohag and five in Beni Suef. Similarly, nine others died in the Red Sea. According to the the health and population ministry, more than 70 people have been injured following weekend floods. Heavy rainfall triggered flooding in several towns in Upper Egypt and along the Red Sea coast. Malaysia – For the second time in two months, flash floods brought Penang to its knees, halting traffic and submerging homes in various parts of the city. Among the areas affected by flash floods were Jalan Paya Terubong and Taman Lumba Kuda. Jakarta, Indonesia – Flash floods hit two villages in Batang Asai district, Sarolangun regency, on Friday, leaving one person missing and dozens of houses inundated. Southern Africa is in the midst of its most severe drought in 35 years, and according to a UN climate envoy, things are forecast to worsen over the months ahead. Following a four-day trip to Mozambique, special envoy on El Niño and climate change Macharia Kamau said “[t]he crisis has yet to peak.” He highlights that the devastating drought will be at its worst at or near January of 2017. Approximately 18 million people have been affected by the drought’s widespread impacts, region-wide. Among the worst-hit countries is Mozambique, with 1.5 million suffering from extreme heat. Zimbabwe, Malawi, Lesotho, and southern Madagascar also fall in the same group. For many children, women and the elderly, the next few months will be about looking at survival straight in the face. Parts of Mozambique have been water-starved for years — with certain areas seeing no rainfall for as much as three years, the nation’s disaster management agency reports. El Niño, which affects rainfall patters by influencing flooding and drought, has been pegged as the cause of the detrimental drought. Grenada health officials reported this week on an outbreak of the childhood viral disease, hand, foot and mouth disease (HFMD). Grenada’s Ministry of Health has received reports of twelve cases linked to daycare and preschool centres across the island. A non-virulent variant of the deadly Vibrio cholerae O1 strain has likely been present in Haitian aquatic environments for several hundred years, with the potential to become virulent through gene transfer with the toxigenic strain introduced by UN peacekeepers, according to research published today by scientists at the University of Florida’s Emerging Pathogens Institute. The Central regional capital Cape Coast has recording new cases of the cholera disease, according to the Cape Coast Health directorate. Some 10 people in the Cape Coast Metropolis have been diagnosed of cholera and are receiving treatment in the various health facilities in the region. The victims mostly adults are said to have eaten contaminated food with element of faecal matter according to health experts. 5.6 Earthquake hits the Tyrrhenian Sea. 5.5 Earthquake hits the Prince Edward islands. 5.1 Earthquake hits the southwestern Ryukyu Islands off japan. Israel – Heavy rains swept across Eilat overnight Thursday, causing serious flooding and forcing the local airport to announce an indefinite closure due to dangerous quantities of water on the runways. In just one night, an entire season’s worth of rain floods southern port city of Eilat, drenching the streets and forcing authorities to indefinitely shut down roads. Egypt – At least nine people have been killed, four seaports closed and nine main highways brought to a standstill due to heavy rains and flooding in southern and eastern Egypt that began Thursday. In the southern Qena province, torrential rains and flooding have paralyzed the Qena-Sohag highway and overwhelmed local drainage and sewage systems. One local security source, said that several vehicles in the area — including buses — had been overturned by intense flooding. The World Wildlife Fund (WWF) Thursday warned in a new report that global wildlife could drop two-thirds by 2020 as a result of human activities. The WWF’s biennial flagship report, titled “Living Planet Report 2016”, measured trends in 14,152 monitored populations of 3,706 vertebrate species. According to the report, global populations of fish, birds, mammals, amphibians and reptiles have already declined by 58 percent between 1970 and 2012. This places the world on a trajectory of a potential two-thirds decline within a span of the half-century ending in 2020. The report identified top threats to species are directly linked to human activities, including habitat loss, degradation and overexploitation of wildlife. For example, African elephants are severely threatened by overexploitation, habitat loss and fragmentation. New data shows that their numbers have fallen by around 111,000 since 2006, to a total of about 415,000 today. Biodiversity forms the foundation of healthy forests, rivers and oceans. Take away species, and these ecosystems will collapse along with the clean air, water, food and climate services that they provide us. By providing an overview of the state of the natural world, human impacts and potential solutions, the WWF aims to support governments, communities, businesses and organizations to make informed decisions on using and protecting the planet’s resources. Tanzanian officials say they successfully killed about 5.6 million red-billed quelea birds that had threatened to ravage thousands of acres of crops in the shadow of the country’s famed Mount Kilimanjaro. The Moshi District Council used airplanes to spray poison over the pests, which are typically seen in the morning and evening hours feeding on paddies before they spend the night in sugarcane plantations. Farmers say they now expect to bring in a bumper harvest without the birds. Most of the coastal floods in South Carolina during the past 66 years caused problems for residents only because of sea level rise, a new study indicates. The report, titled “Unnatural Coastal Flooding,” puts the blame on human activity, the same notion behind the debate in the United States over climate change. The report isn’t referring to major storms, such as Hurricane Matthew, which produced sea surges and storm tides that would have washed over large areas of land with or without the recorded 8 inches of rise in the Atlantic waters. In a follow-up to a report five weeks ago concerning the measles situation in Romania, the Ministry of Health now puts the measles tally in the southeastern European country at just shy of 1,000 cases, according to a Romania-Insider report Friday. 5.8 Earthquake hits Unimak Island, Alaska. 5.7 Earthquake hits New Ireland, Papua New Guinea. 5.6 Earthquake hits offshore Valparaiso, Chile. 5.1 Earthquake hits near the north coast of Papua, Indonesia.